The Medieval Town of Torun is a well-preserved example of a trading city from the 13th and 14th centuries. The town was an important element in the trading network of the Hanseatic League. The World Heritage Site consists of three parts: the Old Town, the New Town and the Castle of the Teutonic Order. The authenticity of the medieval town center is highly praised. 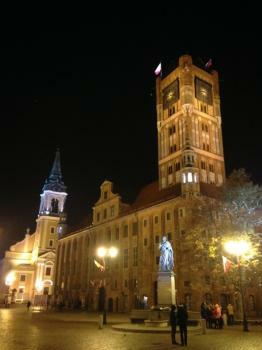 Torun also is the birthplace of the astronomer Copernicus (1473). 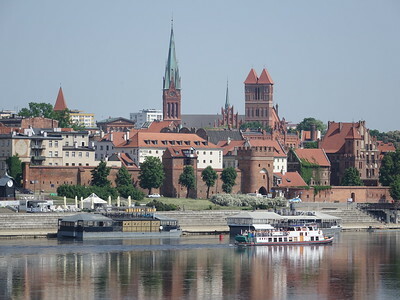 The medieval city of Torun is a small, well-preserved trading town along the Vistula river. I really enjoyed my stay there, and have been thinking since what the attraction was. A major reason is that – despite its considerable size of 200,000 inhabitants – it lies too far off the beaten track for the weekend getaway and stag party crowd (which Gdansk and so many other cities in Central and Eastern Europe have to endure). It still is more a destination for Polish school trips than for foreign tourists. 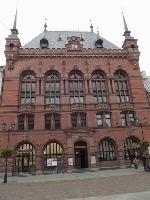 Although it lies only 168km south of Gdansk, it takes significant time to get to Torun by public transport from there. The fastest trains take 2.5 hours, including a change half way. These are not too frequent however, plus it is wise to pre-book them as seats are reserved and do sell out. On the return trip I got stranded at Torun’s railway station because of a delay of 53(!) minutes, which also caused missing my connection. In the end it took me 5 hours to get back to Gdansk. So going only for a day trip from Gdansk is possible but it is a gamble. Fortunately I stayed for the night. The WHS zone comprises 3 parts: the Old Town, the New Town, and the ruins of the Teutonic Castle. On my first evening I walked around the Old Town at ease. It does not have a real ‘medieval’ atmosphere, 80% of the buildings seem to date from the late 19th or 20th century. But the buildings of medieval origin that remain are all true masterpieces of the so-called 'brick gothic'. Red bricks alternate with stones of a different colour or plaster. And that’s a very pretty sight in the evening or morning light. The next morning I further explored the city. First I went to the ruins of the Teutonic Order Castle. The Knights tried to conquer and convert the pagan Prussia from this strategic point. Torun at the time (13th century) was situated in the buffer zone between Poland and Prussia - if you look at the map now it's pretty deep in Poland, roughly in the middle of the country. The famous fort turned out to be a lot smaller than I had thought. There are only a few foundations left after the citizens expelled the Order in 1454 and burned down the fort. West of the fort lies the 'New' Town. This is almost as old as the Old Town, it dates back to the 13th century as well and was built when more buildings were needed for artisans and industry. Both former towns have now grown together. Here in the New Town lies the most beautiful church, at least seen from the outside: the St. James Church. This too is made entirely of bricks. Restoration works are currently going on, so I could not get in. The same issue applied to the Copernicus House. A final bit of trivia: I had Torun connected to the European Route of Brick Gothic. But when I checked the organization’s website in preparation for this trip, Torun was not (or not anymore) there as a member. This also applied to Riga and Vilnius. Only German and a few Danish and Polish cities are included now. Sometime after 2012, Sweden, Lithuania, Latvia and Estonia seem to have left this network. Whilst it is a pleasant and charming city, I was actually a little disappointed in Torun. I think this could be because I, unfairly, had high expectations for it but on the whole its cobbled centre felt a little more tired and scruffy than many others in the country. The central square is pretty and the network of cobbled streets is rather nice as its layout giving clues to the development of the old and new towns. Tucked in here and there are the various sites associated with the town's most famous son Copernicus. There is also the added bonus of escaping to the river banks, especially charming was the panoramic view from the bank opposite showing the broad sweep of the town walls. This platform can be accessed by crossing the road outside the station and walking through the small wooded area, this short diversion came in handy when we were unable to secure a place on our desired train and had an hour to kill in the small station. Another treat is that there plenty of places around town selling Torun's most famous foodstuff Pierniki (Gingerbread) and we had a wonderful time trying out as many varieties as we could the Apricot and Dark chocolate being our particular favourite. At night the rather charming Jan Olbracht Micro-Brewery proved a very welcoming and filling destination, completing a slow paced day around the city which proved to be an enjoyable way to recharge our batteries. So on the whole we had a nice time here but whilst it was very charming it failed to really capture us. Still it is certainly worth a visit if you are heading through the area. Old Town is a very nice complex in Torun. It is possible to spend a lot of time walking on the streets and passages. Especially Nicolaus Copernicus House Museum and City Hall are places you need to see here. And of course, Monument of Copernicus. Nicolaus Copernicus House Museum is a possible place of his birth. Torun is worth a visit by anyone interested in the medieval art and architecture in general. The core area of the town, the Rynek Staromiejski is full of interesting buildings with quirky little details. I spent some time looking for them on the different fascades. I found the most interesting to be the Dwor Artusa and the House under the Star, as well as Copernicus' house around the corner. Sir Nicholas Torun was the original Torun knight for the Teutonic order of Saint Mary's Hospital in Jerusalem. I am a direct decendant. He went to Scotland and got married and changed his last name to thorn. along the way it got changed to thorne. I am a Thorne. For those who like astronomy and related sciences it is a place to visit since it is a beautiful town and also the place where Copernicus was born. I liked a lot the square of the Rynek, the medieval walls and the ruins of the castle of the Teutons. The prices are cheaper than those found in similar places (bars, restaurants) in Warsaw. Don't forget to buy some Gingerbread. I learned there that this was the most famous thing in "Poland" during the middle ages after the Wodka from Gdansk. A bustling friendly city. The town centre (Rynek) is very beautiful and more and more buildings are being renovated. Make your first stop a bookshop for a town guide before you begin walking, this will ensure you do not miss any of the main sights and also point out the more unusual ones which usually have a local tale attached to them. The bookshops also have some beautiful large colour books on Torun or Poland in general. Buying one is a must but make sure you get it at the end of the day because of the weight. Large enough to have many facilities for tourists but small enough to make it possible to explore away from the centre. Make time for a stroll along the Wisla and follow the medieval walls. Hotels and guest houses are now more abundant but always ask to check the rooms first as some may still have a tendency to have a stunning reception but very basic rooms. We have never been disappointed in any of the restaurants so can't recommend any in particular. The tables were always well presented and the food fresh and superbly cooked. We have enjoyed many a beer or coffee with the locals, sitting outside the Ratusz or in the Dwor Atusa across the street. Children will enjoy the story of the legendary 'Flisak' who's statue is beside the Ratusz, 'Leaning Tower', Planetarium or a boat trip on the Wisla to the salt towers at Ciechocinek. War historians can visit the various forts around the city or Barbarka a site of martydom of many Poles from Torun. Going further back it is worth a visit to the ruins of the Teutonic Knights Castle. Adults, children, artists, architects, historians or tourists everyone can find something of interest in Torun. Don't forget to round off your visit with some famous Torun gingerbread, 'Pierniki'. Teutonic Knights: The Teutonic Knights built a castle there ca 1230. (They had a castle in the Lebanon at Toron) - The Castle at Torun was destroyed in 1454 but has been excavated and its remains are part of the inscribed area. 154 Community Members have visited.